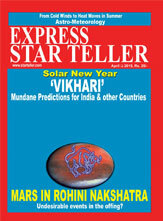 Sun : Upto 14th April , remains in Pisces; thereafter, it will transit in Aries. Mars : Throughout the month , it will transit in Taurus. Mercury : Till 11th, it will transit through Aquarius; thereafter, it will move to Pisces. Jupiter : It will transit through Sagittarius sign till 24th; thereafter, it will transit through Scorpio for the rest of the month. It will move in retrograde motion from 11th till the month-end. Venus : It will transit through Aquarius till 15th; thereafter, it will move to Pisces. Saturn : Remains in Sagittarius sign, throughout the month. 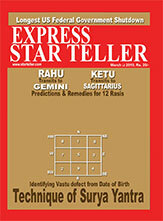 Rahu (True) : Remains in Gemini sign throughout the month. Ketu (True) : Remains in Sagittarius sign throughout the month. Uranus : Remains in Aries sign throughout the month. Neptune : Remains in Aquarius sign throughout the month. Pluto : Remains in Sagittarius sign throughout the month, It will move in retrograde motion from 25th till the month-end.